Opening Night brings the William Macy-directed “Krystal.” Rosario Dawson plays the titular character, a stripper and single mom who also attends Alcoholics Anonymous meetings. Joining Krystal’s AA group is the very sheltered Tyler Ogburn. The young man’s heart condition has prevented him from going to college or even falling in love. But Tyler’s fascination with Krystal sparks a very unconventional love affair. Famed cartoonist/playwright Jules Feiffer scripts “Bernard and Huey.” The reunion of two friends after a 25-year gap turns into a recipe for disaster. What begins for Bernard as a temporary arrangement to let Huey “find his feet” turns into an unwelcome reprise of their old relationship. Bernard returns to being bookish and insecure; Huey re-starts his womanizing ways. Can Bernard’s sexual relationship with Huey’s estranged daughter break the duo’s old behavior patterns? “Adios Amor: The Search For Maria Moreno” is a documentary about unearthing the forgotten history of a predecessor of Cesar Chavez. A trove of forgotten photographs sparks a quest to rediscover the story of labor organizer Maria Moreno. Long before Chavez came along, Moreno sacrificed everything except the welfare of her twelve kids to organize California’s agricultural migrant workers. This documentary brings up questions about who history remembers and why. In the Central European set thriller “The Line,” central character Adam plays two roles. One is father and family man. The other is international cigarette smuggler and unflappable gang leader. But after the Schengen area border gets secured by the government, Adam’s two lives start becoming more complicated. The new Arnaud Desplechin film “Ismael’s Ghosts” features powerhouse performances in this story of a supernatural love triangle. Ismael (Mathieu Almaric) is making a new film when he gets an unexpected interruption. The ghost of former wife Carlotta (Marion Cotillard) re-appears in his life twenty years after her death. Ismael may have a new girlfriend in astronomer Sylvia (Charlotte Gainsbourg). Yet the scientist soon finds that death has not dimmed Carlotta’s ability to entrance the director. The title “Tommy Battles The Silver Sea Dragon” suggests the film has a straightforward plot. Yet the title doesn’t mention the imaginary courtroom that’s a setting for Tommy’s battle. Nor does it suggest the horde of inner demons that Tommy must confront, particularly the ones related to his supposed culpability in his mother’s death. Finally, the title doesn’t give away that this is a musical. Every year, Cinequest presents a classic silent film. This year’s selection is the Lillian Gish masterpiece “The Wind.” Gish plays a rancher’s young bride who’s slowly being driven mad by geographical isolation, the rancher’s frequent absences, and the incessantly howling wind. Dana Nachman and Don Hardy, who helmed previous Cinequest opener “Batkid Begins,” return with the documentary “Pick Of The Litter.” This Kaiser Permanente Thrive Award winner follows a litter of five puppies who undergo training to become possible Guide Dogs for the Blind. Erin Palmquist’s documentary “From Baghdad To The Bay” has a local connection in the form of its subject, former Iraq War U.S. Army translator Ghazwan Alshari. He was forced to flee Iraq when U.S. forces accused him of being a double agent. Now alone in San Francisco, Ghazwan finally faces one big secret (he is a closeted gay) and attempts to reinvent himself as a professional chef. “Orphan Black” star Tatiana Maslany will appear in person for the Maverick Spirit Award screening of her new film “Souls Of Totality.” Maslany is Lady 18, a member of a cult which believes that souls head for Paradise via a gate which only opens during a total eclipse. Lady 18 is secretly in love with Guy 3. That love gets put to the test when she’s chosen to stay behind and gather a new crop of souls. But fulfilling her duty means being permanently separated from Guy 3. In “Eyes And Prize,” four actors come to a well-stocked Bromley flat to participate in a secret reality show. But things start getting weird when the organizers of the show don’t show up and the actors themselves have no idea what the show is about. Another sort of surprise takes place in the comedy “It’s A Party.” When a planned surprise birthday party for a mutual friend goes off the rails, the guests find a different way to entertain themselves. But using coke, molly, and any other drugs these friends have handy turn the gathering into a far more wild party. Four indigenous siblings were forcibly separated as children as part of the Canadian government’s notorious “Sixties Scoop” policy. Now in their 50s and virtual strangers to each other, this quartet comes together for a week to try re-establishing their family connections. The documentary “Birth of a Family” shows what happens over this week. Would you be so willing to avoid conscription in an unjust war that you’d hide away from the world for 21 years? The titular Joseph in “Mother, I’m Joseph” makes that choice to avoid fighting in the Iraq and Iran Wars. Yet is the mental strain placed on both mother and son worth the deception? The entertaining documentary “Brothers In Arms” closes out Cinequest 2018. 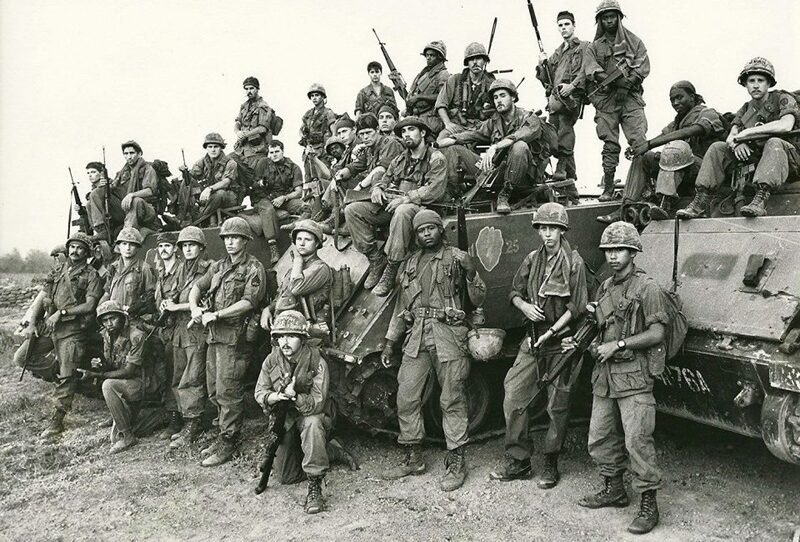 It’s the behind the scenes story of the making of Oliver Stone’s classic Vietnam War era drama “Platoon.” Who knew this independently produced low budget film made with then-unknown actors would launch an incredible number of careers? The cast included Johnny Depp, Willem Dafoe, and Charlie Sheen. Director Paul Sanchez was himself a member of the “Platoon” cast. Meanwhile, Sheen provides offscreen narration. Obviously, there are more titles of interest at Cinequest than can be mentioned here. They include a Wim Wenders romance, a drama about destitution starring Michelle Pfeiffer, and a historical drama about the fiery woman who leads a 19th century Bulgarian rebel band. Make the trip to the South Bay and enjoy Cinequest’s cinematic fruits.